Products / Advent Super Box 2018: Packed with daily, weekly, and monthly materials! Advent Super Box 2018: Packed with daily, weekly, and monthly materials! Spend the season of Advent preparing your family for Christmas! 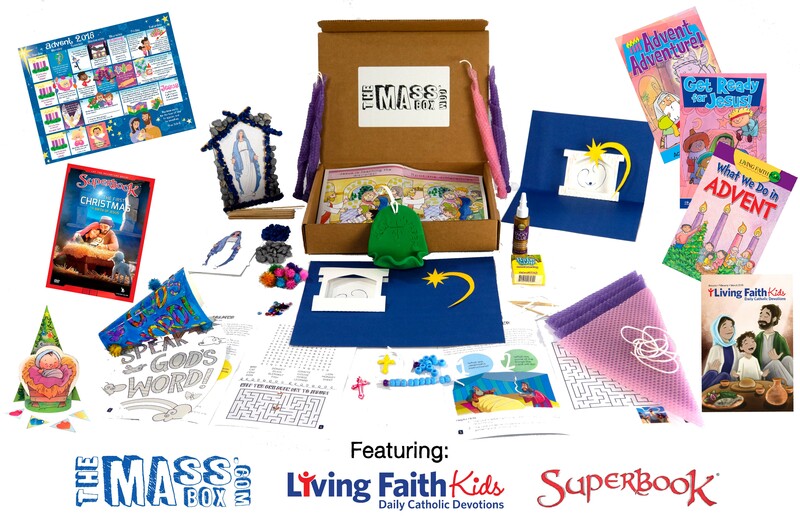 This Super Box for Advent 2018 is jam packed with materials for kids aged 4-8 from The Mass Box, Living Faith Kids, and SuperBook. It features Advent daily, weekly, and monthly materials! You'll make your own Advent candles, follow through Advent with an Advent calendar and daily prayer/activity book, watch the animated story of the first Christmas, and make SIX more crafts. Each craft comes with a companion magazine with the Sunday/Holy Day readings, activities, and the craft directions. The Mass Box team also makes a webisode video to show how to make the craft and open the door to discussion about the readings with your kids! The total box value, if you were to go shop on your own (forget your time spent finding everything!) is over $70 per child! Order early as we expect to sell out. Boxes cover materials for the whole month of December, including Christmas and the Feast of the Holy Family. If you would like to be a regular Mass Box subscriber instead, click subscribe above! Orders ship beginning November 20; orders placed after November 20 will be mailed 1-3 day USPS priority mail. USA only - shipping included!